One thing I have always enjoyed doing is working with my hands – wether it’s making something, fixing something, or even drawing. I find that the professional skills I use to solve problems in system architecture, design, and system development using programming languages like C# transfer to problem solving when I am doing repairs on my house. It’s an interesting exercise to know whether there’s a problem with some part of my house, figure out the problem’s essential aspects, come up with various approaches, and figure out how to execute a particular approach. In the photo I am preparing several windows for painting and saw that there was more to the job than picking a color and starting to paint. There was a lot of prep work to do – mostly around repairing gaps, filling in wood, and sealing joints. 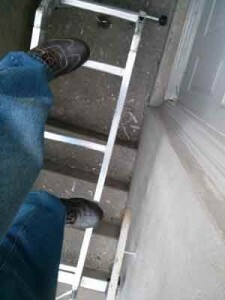 Part of the problem solving was figuring out how I was going to get to the windows – they’re in a really awkward place. The point of this post is that I wanted to say I really enjoy solving problems of various types including software as well as other types of problems. Stay safe!